I initially became interested in this alternative type of medicine about 15 years ago, at that time, I was involved in enhancing the athletic performance of my children through optimal nutrition. All my children were good athletes. In fact, both of my sons played college and minor league baseball. Nutrition is practical biochemistry and it is something almost totally neglected in medical school. We can never be healthy without proper nutrition, yet conventional medical largely ignores it. It really opened my eyes. Just as optimal nutrition enhanced my children’s athletic performance; poor nutrition made my patients sicker. The calorie dense, nutrient poor diet high of simple carbohydrates, trans-fats and processed meats, as well as vegetables and fruits low in phytonutrients and antioxidants made my patients obese and hypertensive. This type of diet resulted in insulin resistance and raised cholesterol and inflammatory markers with a consequent rapid decline down the road of vasculopathy and end-organ damage. The research into nutrition that benefited my children prompted a path of study and research that allowed the development of this template to restore some measure of physiologic youth in patients which helps to slow the aging process and the attendant age-related diseases. To my great surprise, many doctors are coming to the same conclusions as I have or actually beating me to the punch in terms of doing research and implementing protocols. Most of the work was being done, and is in fact, being done currently by physicians associated with the A4M (American Academy of Anti-Aging Medicine). I was Board Certified by this organization summer of 2013. This organization has over 20,000 members worldwide. I am Board Certified in Nephrology, Internal Medicine and Critical Care by the American College of Physicians. ICRM continues to grow as a hormone clinic in Boise and address other anti-aging concerns with more natural solutions. I moved here to Boise, Idaho in January of 2009. It is something that I wanted to do for a long time and haven’t regretted it in the least. I love Idaho, the mountains, the outdoors, and Boise itself – which I think is the best kept secret in the country! I am married to Debbie Crosby Haake who is an RN in the office and helps me with the business end of my practice. Between us we have 5 grown children and 6 grandchildren. We are active with traveling, hiking, fishing, road biking and working out. We attend the North End Collective Church here in Boise where we are blessed with a group of good friends and we are encouraged in our faith by Pastor Bill Briley. Attended college at Rockhurst University, a Jesuit school in Kansas City, Missouri. Graduate school in biology for a year after graduation at the University of Missouri, Kansas City. Thereafter, I attended the Kansas City College of Osteopathic Medicine for four years. Completed a rotating internship through the Jacksonville Health Education Program in Jacksonville, Florida, which was sponsored by the University of Florida at Gainsville. Completed an Internal Medicine Residency at St. Louis University in St. Louis and a Fellowship in Nephrology, also at St. Louis University. Teaching faculty of the St. Louis University School of Medicine between 1982 and 1985. On the staff and the teaching faculty of St. Louis Regional Medical Center in St. Louis for five years. Passed my Boards in Nephrology, Internal Medicine and Critical Care. From 1988 to 2008, I was in private practice in Belleville, Illinois. I was spending most of my time at Memorial Hospital and St. Elizabeth’s Hospital in Belleville. 30-40% of my time was spent in Critical Care. The rest of the time was spent in Nephrology. I was the Medical Director of three dialysis units in the metro-east area of St. Louis. DaVita Dialysis Center in Granite City, Illinois and two RAI Dialysis Centers – one in Fairview Heights, Illinois and another in Breese, Illinois. In January of 2009, I moved to Boise, Idaho, after selling my practice in Bellville, Illinois. I have since become Board-certified with the American Academy of Anti-Aging and Regenerative Medicine and enjoy a thriving practice assisting patients reach their goals of optimal health and well-being. 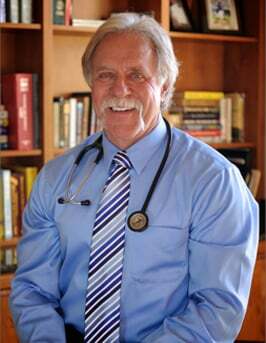 In January of 2009, I moved to Boise, Idaho with my wife, Debby, after selling my practice in Belleville, Illinois. Here, I practiced as a Hospitalist for six months at St. Luke’s Hospital before taking a position as a Nephrologist with Idaho Nephrology Associates for two years before retiring.